We are open every day from 16th February to 24th December 2019. Buy farm admission tickets here at 10% discount compared to the price you pay at the entrance. Select the number of each ticket type that you require and the date of your visit, then select 'Buy Now' to pay. The ticket will be emailed to you instantly, so please don't forget to enter your email address when you pay for the tickets! Please print out the email and bring it with you to the farm or show it on your phone - this email is your ticket. Note that children under the age of 2 are free, so please do not purchase farm entry tickets for children below this age. The ticket will be emailed to you instantly, so please don't forget to enter your email address when you pay for the tickets! Please print out the email and bring it with you to the farm or show it on your phone - this email is your ticket. Buy a ticket to visit the Easter Bunny in the Giant Rabbit Burrow*. Click required date to purchase. 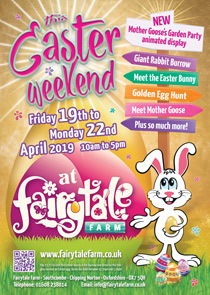 *Please note that this ticket provides entry to the Giant Rabbit Burrow to meet the Easter Bunny, listen to a special Easter story and be presented with a full-size Easter egg. It is payable for any child visiting the Easter Bunny, who is to receive an Easter egg. This ticket does not give entry to Fairytale Farm. Admission tickets should be purchased from the pull-down menus above as normal. Adults go free to see the Easter Bunny, when accompanied by a paying child. More details on this event here. LIFETIME PRICE GUARANTEE! We guarantee that if you do not cancel your Annual Pass the price will not change* from the price you pay today. Every year you are a member, the price just gets better and better! *Applies to direct debits only, when monthly payments are continued without a break. Pay by monthly direct debit and benefit from our Lifetime Price Guarantee. If you choose to buy online, please bring your online receipt with you on your first visit and the pass will be created at the admissions desk when you enter the farm. Full terms and conditions are here. *No more than 30 days after expiry of current Annual Pass. Please make sure that the lead name is the same as that on the current Pass. If you have any questions, please contact Fairytale Farm at info@fairytalefarm.co.uk. 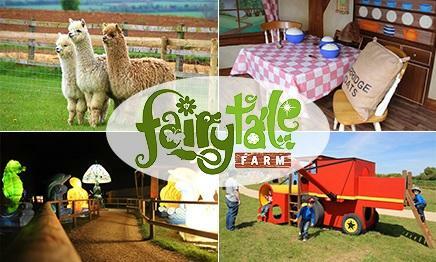 A Fairytale Farm gift voucher can be used for admissions, in the cafe or in our shop. It is a perfect gift for any occasion. Buy online and we will post the voucher to you free of charge. Choose the number of vouchers and voucher value below.